This is a beautiful and feminine large shoulder bag, shown in suede with printed leather details, also shown in leopard print on cowhide fur with leather details, or in Leather with printed reptile on leather details. 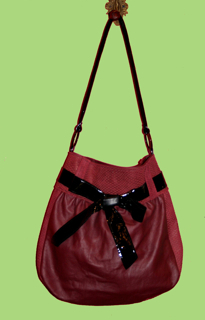 The interior has one large zipped pocket and is lined in a fanciful co-ordinating satin. The outer edge is piped with the contrasting material and a metal magnetic closure at the top center opening. Big metal O-rings attach the strap to the bag. 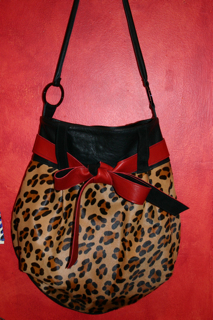 By Custom Order in suede, fur or leather and available in many colors and textures.